"Westbrook Junior College Students on the Green, Fall 1934"
Thirteen Westbrook Junior College students pose on the Green, backs to College Street and the three houses across College Street, in this black and white 1934 fall photograph. 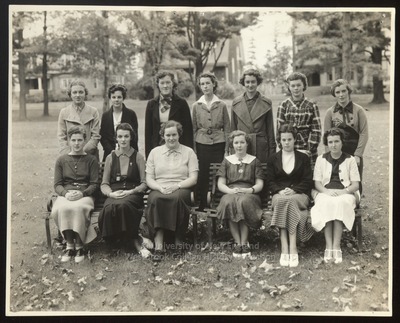 Seven students stand in the back row; and six students, hands clasped in their laps, sit on two metal benches in the front row. Most wear wool skirts and sweaters; four of the seven girls in the back row wear woolen coats. The prominent hair style is short, curly hair parted on the side or in the middle. The three houses visible behind the students include the Johnson Faculty Club on the right and the Dow/Fuller house to just to the left. Handwritten on the back of the photo is "W.J.C. Students 1934."